What a fun night. You pay for the entertainment and it is awesome! Food is okay. I'm not really into poi or overcooked rice noodles. Dessert tasted like it had been frozen and then thawed. Alcoholic drinks were perfection. I recommend paying for the Plumeria package. No lines, front seats. A great evening out. Plenty of food and entertainment. Highly informative about the different cultures through the medium of music and dance and a great opportunity to try different local cusines at the all you can eat buffet. We experienced a brief rain shower but staff were straight out with ponchos so we could carry on with evening. Very welcoming and helpful. Germaines Luau was nice. Food was different and pork was a little too rich. The pineapple on the table was delicious. People were very friendly. When I booked this I was given the wrong pick up time. Good thing I called them they did not call me to find out what was wrong. When I called they told me that my pick up time was at 4:20 but all of my paperwork indicated that it was at 5 pm. Granted, I was able to schedule another evening but that was not easy as my time was very booked up and I had to shift a few things around. If I would have had this Luau at the end of my trip or not able to move things around, I would have been out of a lot of money. All seat are great seats so don't worry about getting a great spot up front to see the show it is not worth it. General seating is just fine! The food was not that great - What was great was the dancers! They made the evening. 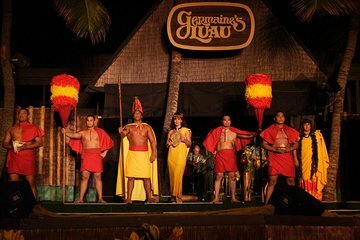 I also had another Luau to go to at the end of my visit which was paid for by the business/conference that I attended so I got to compare one Luau with another and by far the Germaine's is not one that I would recommend. Excellent experience at Germaines. Highly recommend the Luau. Worth it to upgrade to Plumeria. Wonderful tour guide!